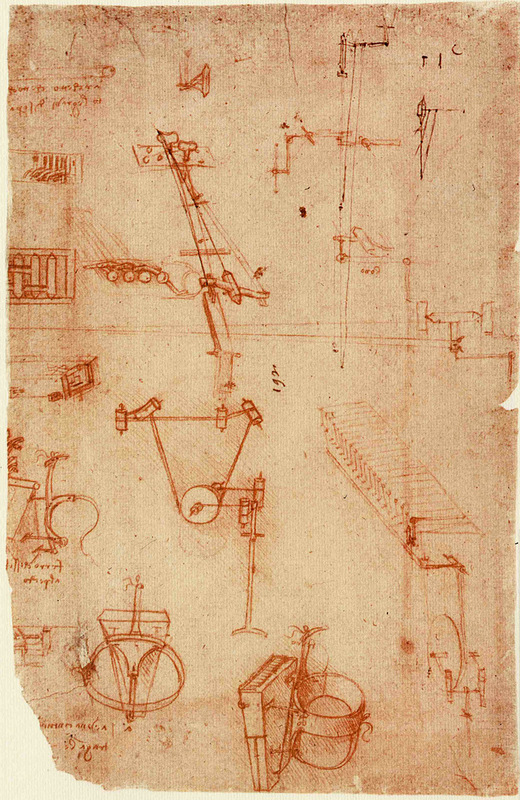 The most illustrious of inventors, Leonardo da Vinci, was not moved by conventional ideas about success. He took commission after commission from his wealthy, aristocratic patrons, created meticulous plans, then moved on to the next thing without finishing—as if he had learned all he needed and had no more use for the project. The works we remember him for were a tiny handful among thousands of planned designs and artwork. They have the distinction of being his major masterpieces because they happen to be completed. Had Leonardo finished all of his proposed projects, they would fill the Louvre. He was content to leave many of his paintings unpainted, sculptures unsculpted, and inventions unbuilt—sketched out in theory in his copious notebooks, protected from theft by his ingenious cryptography, and left for future generations to discover. One such invention, the Viola Organista, might have changed the course of musical history had Leonardo had the wherewithal or desire to build one in his lifetime. Or it might have remained a minor curiosity; there is no way to know. Zubrzycki spent four years working on his Viola Organista. A few years back, we featured a brief performance, his first public debut of the instrument in 2012. Now, we have much more audio of this incredible musical invention to share, including a longer performance from Zubrzycki at the top of the post, Marin Marais’ Suite in B Minor, performed in 2014 at the Copernicus Festival in Krakow. (You can see the full concert just above.) Despite these notable performances, and his notable creation, Zubrzycki is not the first to build a Viola Organista. In 2011, Eduardo Paniagua, another musician devoted to Leonardo’s instrument—which does indeed sound like a “one person string ensemble,” as a commenter at this MetaFilter post noted—released a disc of 19 songs by Baroque composers, contemporaries of Leonardo, played on a Viola Organista built by Japanese maker Akio Obuchi. (Hear the full album on Spotify above.) Accompanying the album, writes Spanish site Musica Antigua (quoted in English here via Google translate), is “a profusely illustrated booklet with eleven of the organist viola prototypes that Leonardo himself devised,” with descriptions of the instrument’s operation by Paniagua. Though Leonardo himself never built, nor heard, the instrument, it did attract interest not long after his death. “The oldest surviving model,” notes Musica Antigua, “is in El Escorial and is dated at the beginning of the seventeenth century.” Every version of the Viola Organista worked from original design specs like those in Leonardo’s hand above, using wheels to bow the strings when the keys are pressed, rather than hammers to strike them. It’s an ingenious solution to a problem musicians had sought for many years to solve: creating a keyboard with rich dynamics and sustain. Whether Leonardo’s design is superior to other attempts, like the clavichord or, for that matter, the piano, I leave to musicologists to debate. We might all agree that the sound of his instrument, as played by Paniagua and Zubrzycki, is truly original and totally captivating. Once reserved for rebels and outliers, tattoos have gone mainstream in the United States. According to recent surveys, 21% of all Americans now have at least one tattoo. And, among the 18-29 demographic, the number rises to 40%. If that number sounds high, just wait until tattoos go from being aesthetic statements to biomedical devices. At Harvard and MIT, researchers have developed "smart tattoo ink" that can monitor changes in biological and health conditions, measuring, for example, when the blood sugar of a diabetic rises too high, or the hydration of an athlete falls too low. Pairing biosensitive inks with traditional tattoo designs, these smart tattoos could conceivably provide real-time feedback on a range of medical conditions. And also raise a number of ethical questions: what happens when your health information gets essentially worn on your sleeve, available for all to see? To learn more about smart tattoos, watch the Harvard video above, and read the corresponding article in the Harvard Gazette. Humans are proud of rationality, maybe to a fault. It can come at a significant cost: the tendency to overcomplicate the simplest of tasks, not the least being the task of life itself. Treatise after treatise, discourse after discourse, book after book, lecture after lecture appears over the centuries, promising to show us how to live the good life. We struggle, amidst the hundreds of other operations we must perform at any given time, to remember complex ethical systems in the moment, to incorporate new postures and routines. Try to live your life in a way that you will not regret years of useless virtue and inertia and timidity…. You make your own choices… pick up the battle and make it a better world, just where you are. The one about the dog whisperer, the one about how job interviews and sports drafts work (or don't), the one about the ideas Apple took from Xerox PARC to create the personal computer as we know it: most of us have a favorite Malcolm Gladwell article. (I happen to like the one on how an Austrian architect invented the American shopping mall, so much that I've previously cited it here on Open Culture.) Those all ran in the New Yorker, where Gladwell has contributed since 1996. Since then, his enterprises have expanded to include bestselling books, much-circulated TED Talks, and even a hit podcast. How does he do it? We now have the chance to learn just that in a new online course taught by Gladwell himself, going live this spring on Masterclass. (You can pre-enroll right now.) Though many know him only from his speaking or audiovisual media, the core of his work still gets done when he puts words on a page. Hence the title and subject matter of his Masterclass: "Malcolm Gladwell Teaches Writing." For the standard price of $90 to take the course once, or $180 for an unlimited pass to every course on the site, we're promised insight into how Gladwell uses ordinary subjects to help "millions of readers devour complex ideas like behavioral economics and performance prediction" and an understanding of how he "researches topics, crafts characters, and distills big ideas into simple, powerful narratives." "We're going to talk about suspense, structure, research, humility, characters, puzzles, and semicolons," says Gladwell in the course's trailer above. He also mentions one of the common mistakes he'll correct: that "writers spend a lot of time thinking about how to start their stories and not a lot of time thinking about how to end them." If you've always wanted to write Gladwellian prose — "at an eighth grade level," as he himself describes it, "but with ideas that are super sophisticated" — this Masterclass' twenty lessons will get you putting in a few of the ten thousand (or so) hours you need to attain mastery. That might sound like a lot of time, but keep Gladwell's words of guidance in mind: "The job of the writer is not to supply the ideas; it is to be patient enough to find the ideas." When I get to muttering in my beard about kids today, the subject oft turns to digital music and how everything sounds the same and looks the same and “what ever happened to album covers, man….” I mean I know they still exist, but they’re terrible, right? Shiny thumbnail-sized afterthoughts with no more purpose than candy in a shop window display? I will admit it, and not without some chagrin, I’ve always thought that whoever designed Taylor Swift’s 1989 had a canny sense of the derivative as a quality one should wear proudly on one’s sleeve—it’s evocative!, in a fun way, not in the way of her most recent, severely Teutonic cover incarnation. So, it’s not all bad, because there's one good Taylor Swift album cover. But then album art has never been all good. Far from it. I remember album covers like this and this and these being the norm. And then there’s … well you’ve probably seen these jaw-dropping monstrosities from the distant past…. Maybe the truly awful album cover is as rare a treasure as the truly great one. Maybe the album cover is as it always was, despite so rarely appearing in a physical form: sometimes an inspired work of art, sometimes a half-assed, tossed-off marketing job, sometimes a half-baked, so-bad-its-good (or not) concept, completely unrelated to the music. It can sometimes seem like all we have left is nostalgia, but nostalgia can be done well, as in 1989 (even if that record’s cover does evoke, in part, an image from Joni Mitchell’s weird stint in blackface). Or it can be done badly, as in Justin Timberlake’s widely disliked 2018 Man of the Woods, which makes a lame artsy attempt to dress up the fact that it’s kinda ripping off 1989 four years later. I do not know how to evaluate Miley Cyrus' various Miami Vice-themed covers for her album Bangerz, which came out in the same year as 1989, except to say, good for her for going all the way with this, like, why hold back? 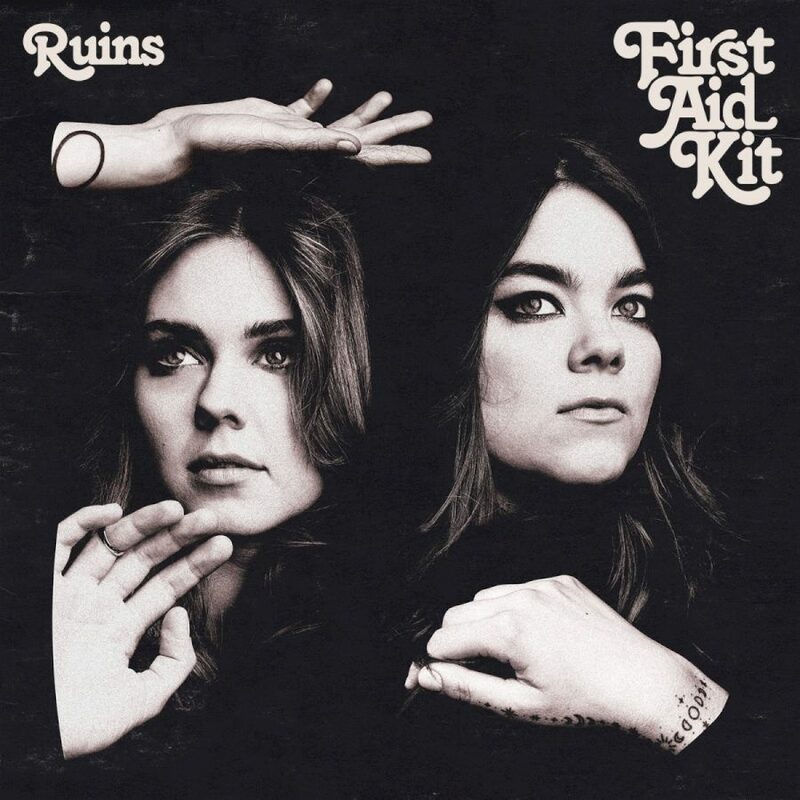 Other recent album covers mime the style of decades past with real swagger, like Swedish folk sister duo First Aid Kit’s Heart-inspired Ruins cover, at the top, featuring one of many retro 70s fonts that have returned of late, as easy to read in thumbnail images as they were on 8-track tapes. 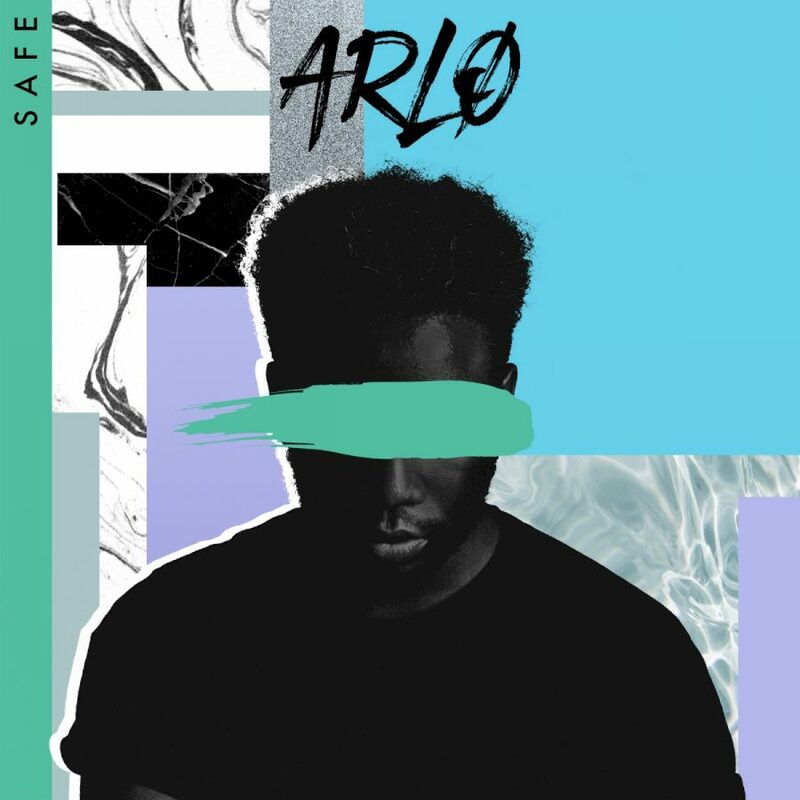 The cover of London artist Arlo’s 2017 single “Safe” has its obvious 80s Duran Duran pastel and marble swirl deco trends down, tastefully and knowingly applied. You can do your own cultural anthropology of the album cover, from 2018’s era of eye candy glamor, and the recent creative—and not-so-creative—repurposing of the past, to the genuine articles from the 50s, 60s, 70s, 80s, and 90s at the Cover Art Archive, a joint project of the Internet Archive and MusicBrainz, an “open music encyclopedia that collects music metadata and makes it available to the public. You may find, as you browse and compare genres and eras, that perhaps the album cover is in decline, or you may find that it is alive and well, still an innovative form despite the massive shift in modes of production. 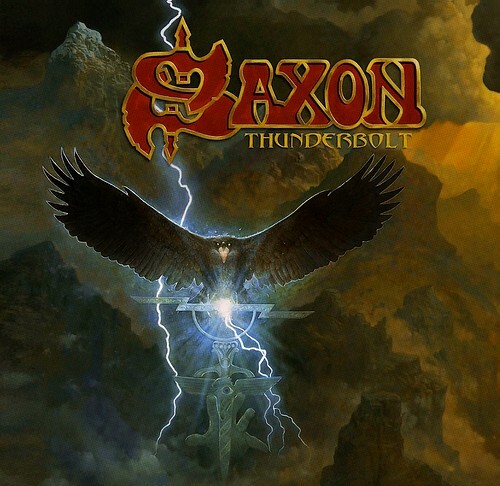 At least aged British metal band Saxon, a true original, still keeps it real, further up, with the cover of their 22nd album, 2018's Thunderbolt. Many of Saxon's progeny have continued in the tradition of high fantasy metal cover art. Some things will never return. 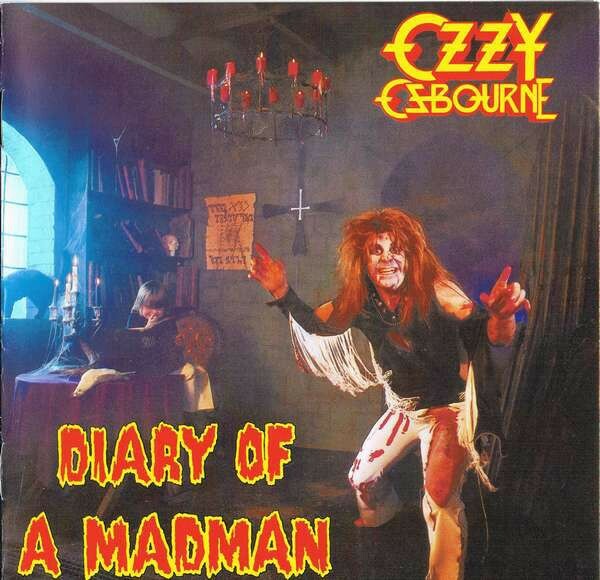 There'll never be another Diary of a Madman, that's for sure, or another Ozzy. 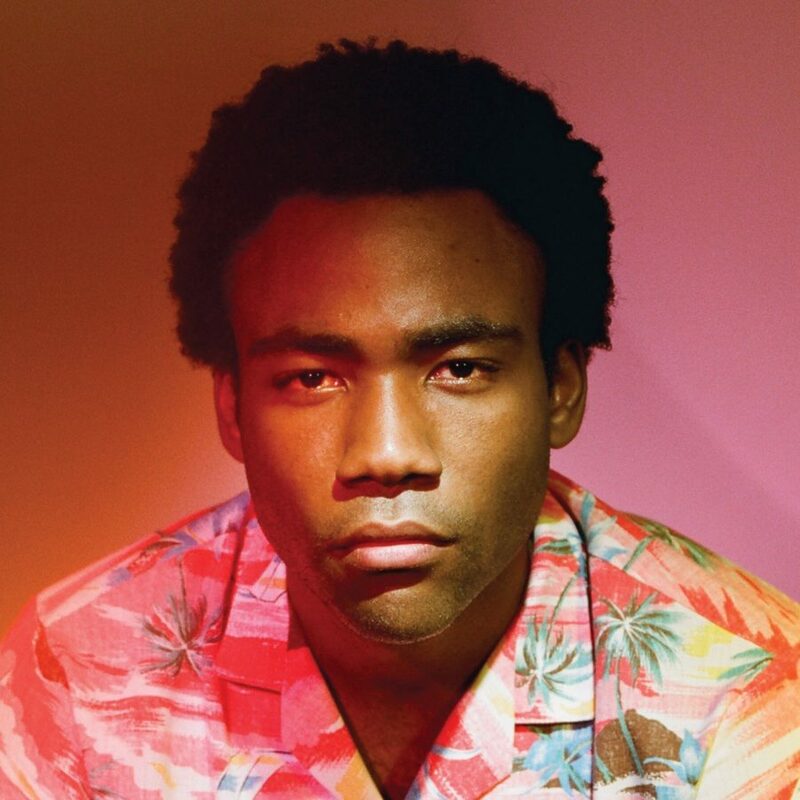 But the in-your-face soft-focus garishness of the 80s, and the styles of nearly every other decade, live on, to take a phrase from Childish Gambino’s 2013 outing, Because the Internet. Enter the Cover Art archive and start searching by year, artist, and other parameters here. We've all had our wits scared out of us by films, images, and the written word, but somehow few forms work their haunting magic quite so effectively as sound alone. Think of the snap of the twig in the woods or the creak of the staircase in the empty house — or, to take it farther, the sound of possessed children speaking in tongues. You can hear recordings of that and other unusual phenomena at Ubuweb, which hosts the collection Occult Voices – Paranormal Music, Recordings of Unseen Intelligences 1905-2007. The eerie recordings on offer include "audio documents of paranormal phenomena including trance speech, direct voices, clairvoyance, xenoglossy, glossolia including ethnological material, paranormal music, 'rappings' and other poltergeist manifestations as well as so-called 'Electronic voice phenomena.'" A rich mixture indeed, and one that begins with those possessed kids, all of them recorded in the post-Exorcist late 1970s and early 80s; you can hear the eight-year-old "Janet" sounding not unlike the devil-filled Linda Blair in the recording embedded above. Later we hear from mediums like Britain's famed Leslie Flint, one of the last of his kind to ostensibly speak directly in the voices of the channeled deceased, including figures as accomplished and distinctive as Oscar Wilde in 1975 (above), Charlotte Brontë in 1973, and Winston Churchill in 1980. The collection also contains the voice of Arthur Ford, who made his name as a medium by claiming to have made contact with the spirit of Harry Houdini. In the clip above, you can hear five minutes of Ford's final Houdini séance, conducted in 1936. 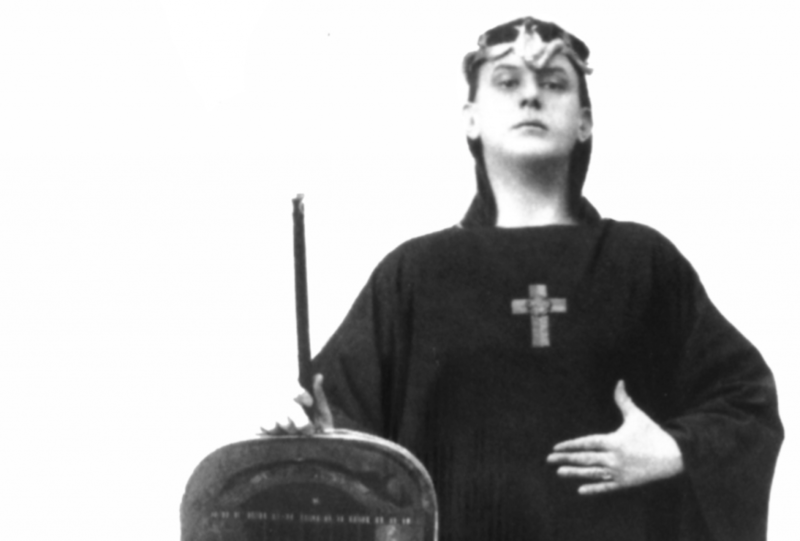 No collection of occult materials would be complete, of course, without something from Aleister Crowley, surely the most famous occultist in modern history, and one known in his time as "the wickedest man in the world." Just above we have Crowley reciting "The Call of the First Aethyr," a piece of occult poetry he recorded in a 1920 session that produced the only known recordings of his voice. Though Crowley, like many of the other spiritualists captured here, hailed from Britain, much of the material in the collection comes from Germany, especially the kind of paranormal music heard just above. But no matter where in the world these recordings were made, and whether or not you believe in the existence of other realms beyond that world, describing any of the recordings gathered here will leave you grasping for any adjective besides otherworldly. Enter the archive of Occult Voices here. So unfashionable for so long, progressive rock has lately come in for a re-evaluation. The qualities that current music critics have come to appreciate — often the very same ones that bothered so many of their colleagues in the 1970s — include its technical virtuosity, its compositional inventiveness, its sheer performative unabashedness, and its willingness to draw from other forms of art, especially literature. Or literature of a certain kind, anyway: having previously featured prog-rock adaptations of Isaac Asimov's I, Robot by the Alan Parsons Project, George Orwell's 1984 by Rick Wakeman, and H.G. Wells' War of the Worlds by Jeff Wayne, today we give you Jules Verne's Journey to the Centre of the Earth as adapted by Wakeman in 1974. You can listen to the album, which All Music Guide's Mike DeGagne calls "one of progressive rock's crowning achievements," on Spotify (and if you don't have Spotify's free software, you can download it here). "With the help of the London Symphony Orchestra and the English Chamber Choir, Rick Wakeman turns this classic Jules Verne tale into an exciting and suspenseful instrumental narrative," using not just his own Hammond organ and Moog synthesizer but Blow-Up star David Hemmings' recitation of Verne's words as well. "Recorded at London's Royal Festival Hall, the tale of a group of explorers who wander into the fantastic living world that exists in the Earth's core is told musically through Wakeman's synthesized theatrics and enriched by the haunting vocals of a chamber choir." 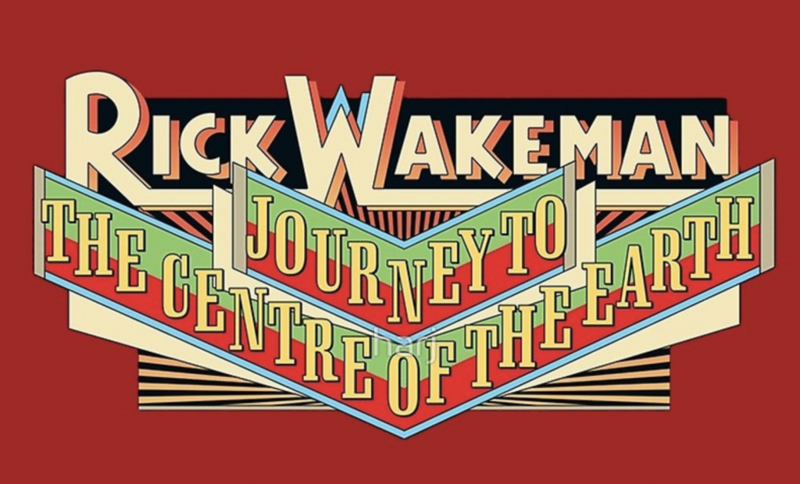 Wakeman's Journey to the Centre of the Earth demonstrates what not just Verne's subterranean explorers but all the best prog-rockers have in spades: ambition. And though the work evidences deep familiarity with the novel on Wakeman's part, you needn't have read a page of Verne — nor of the recent books attempting to bring prog-rock to respectability — to enjoy it. You don't even need to take it seriously, as one All Music Guide user-reviewer, present as a wide-eyed teenager at the Royal Festival Recording, adds: "It was all very avant garde and I felt quite sophisticated as a 16-year-old attending the show with smart kids who use to sit around crossed legged on the floor listening to Dark Side Of The Moon." For him, the album now provides "a view back to the oh so earnest days of grandiose prog-rock and for that reason alone it can be seen as something it never was at the time... fun!"